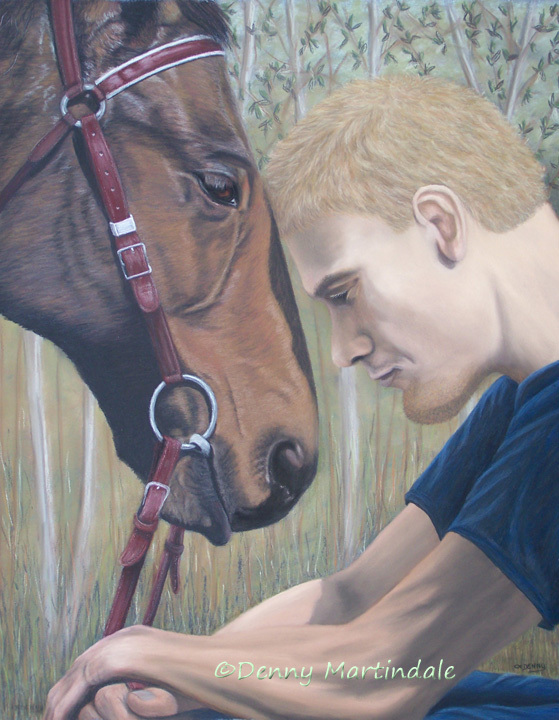 A friend of mine from Australia brought me some photos of her brother and a horse and asked if I would do a portrait for her. I agreed, and she told me the story of the pose she wanted the composition based on. In the movie, The Man From Snowy River, Jim Craig rides his horse down a vertical cliff. My friend, her brother, and some of their friends went to a riding stable that offers a ride like the one in the movie. She said the owner assigned the horses and when he got to her brother, he apologized and said he only had one left, one that never really got along with anyone. Her brother (a huge animal lover) said he would give him a go, and the two got along splendidly. After the intense ride, everyone was stopped for a break. She looked over at her brother and snapped a photo of the horse letting her brother rest on his forehead. My friend gave the painting to their father, so it now resides in Australia.